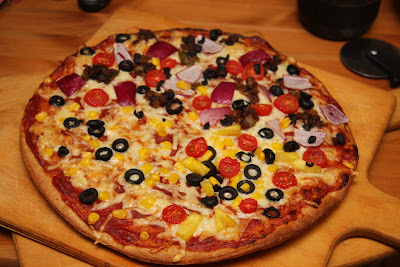 Tired (oh, so tired) of Emeth's incessant rejection of my beautiful pizzas as "disgusting", I one day had the brilliant idea of getting him to put whatever he wanted on his (stupid) pizza. After a long and exhaustive search for toppings we finally found one he was willing to tolerate. Corn.Yes, corn. Just corn. He was even excited to have his very own corn pizza. Istra, always fearing someone else might get something good, then requested corn also. And so a tradition was born. Anyhow, Emeth actually eats his corn pizza, and does not complain about pizza (as much) anymore. So, it's all good. Just in case you're curious, the meat-like topping on the "adult" side of the pizza is actually some globs of left-over taco filling (made from Yves "ground round", lentils & seasonings). Sounds a bit strange, but worked extremely well. Taco pizza!